BALTIMORE - No. 1 starters like Josh Beckett feel they should dominate any team they face. When they don't, they beat themselves up. Beckett's experience in last night's 5-4 loss to the Orioles was no different from what Roy Halladay has been going through in Toronto. These guys are ultracompetitive, and when they don't end losing streaks, when they fail to protect a 3-0 lead as Beckett did last night, it's incredibly disappointing. Beckett has proven beyond a reasonable doubt that he's one of the great money pitchers in the game. He has that surliness about him that extends to the mound and is behind every pitch he throws. It's the same kind of mean streak Bob Gibson used to have. The same nastiness Jack Morris pitched with. In fact, Morris, now a Twins broadcaster, said how much he enjoys watching Beckett because he pitches with so much spirit and emotion and confidence. But even the great ones get beat. Even the great ones can't protect leads from time to time. Even the great ones can't always come up with a win after a loss. That is what stuck in Beckett's craw last night. You could see his focus even before the game. He came into the dugout around 6:20 p.m. and just stared out at the field. You could see the wheels turning in his head and that scowl on his face - the game face, if you will. No one dared say a word to him. Even pitching coach John Farrell walked by and didn't even look at him. Beckett, who allowed 11 hits and 5 runs in 5 2/3 in nings, said his bullpen warmup was normal, but once he began to execute pitches in key situations, he wasn't able to transfer the game he had envisioned onto the field. "He hasn't had a game where he's locked in completely mechanically, but he's close," said catcher Jason Varitek. "He's really close." Among the tamer words Beckett used to describe his performance was "brutal," a word he referenced a few times amid expletives that are not printable. He allowed seven two-out hits, saying it was all part of a horrid night on which he couldn't execute pitches when he needed to. Really, he was on the verge of pitching a gem, but every time he went to throw that one pitch that coulda, shoulda, woulda got him out of an inning, the Orioles kept innings alive, and it eventually paid dividends for them. It was no wonder the Orioles felt as if they'd won the World Series after holding on for the win with excellent relief pitching by lefthander George Sherrill. Beating Beckett is a pretty impressive feat. "You're supposed to get outs," Beckett repeated. "If you don't execute pitches, you don't get outs. It's pretty simple." He retired the first five batters he faced and seemed to have the usual zip on his fastball. But with two outs in the second inning, it began to unravel with a single to right by Luke Scott, an infield hit by Adam Jones, and an RBI single by Jay Payton. Varitek said of Payton, his former Georgia Tech teammate, "That was just a great piece of hitting right there. You just have to tip your cap to him." Unfortunately, they would be tipping their caps to a lot of Orioles. The third inning was so frustrating because Beckett, holding a 3-1 lead, allowed singles to the top of the order (Brian Roberts and Freddie Bynum), then struck out the next two batters, Nick Markakis and Aubrey Huff. Then came Kevin Millar's RBI single and Scott's three-run homer. "It was a [expletive] pitch," said Beckett. "It was right down the [expletive] middle." Beckett felt he had no good innings, though the 1-2-3 first clearly was one. "They were all [expletive] tough innings," he said. "I threw 104 pitches [actually 97] and I think I executed one of them, so . . . tough night. The loss definitely goes into the right man's hands tonight." As bad as he felt, he surmised, "I don't think tonight it really mattered. Just fortunate, like I said, that the loss falls in the right spot. You'd like for the offense to pick it up, but like I said, you don't want someone else to get the loss when you're [expletive]." Varitek was nowhere near as hard on his ace. The captain said, "The only mistake he really made was the pitch to Scott. He's a low-ball hitter and we didn't get it in the right spot. A lot of those hits found holes." Varitek's job, in part, is to keep Beckett's emotions in the right place. He knows he's dealing with one of the most competitive people in baseball, which is a trait that helps make Beckett as good as he is. But can those emotions sometimes get the better of him? Varitek didn't think so. 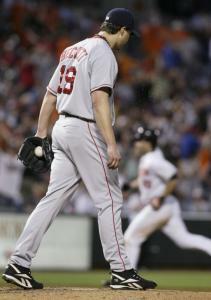 "He just vents and gets it over with," said Varitek. "It doesn't ever appear to get to him or get the best of him when he's on the mound. "He's our No. 1, and he's getting to the point where he's going to be locked in. He's real close." Last night, things just looked worse than usual. The Sox dropped out of first place. J.D. Drew sprained his left wrist. Coco Crisp came out with headaches and nausea. Kevin Youkilis was playing right field. David Ortiz was ejected in the ninth inning. Terry Francona was gathering his family to head to Arizona for his mother-in-law's funeral. Sox pitching hasn't been very good lately. For the fifth time in seven games, the Sox permitted 10-plus hits. The staff has allowed 75 hits in the last 59 1/3 innings. This was Beckett's night to stop it. That's what aces do. He didn't, and he was bleepin' angry.